Japanese automaker, Honda is all set to launch the all new Accord Hybrid sedan in Japan, which has been claimed to return an outstanding 29kmpl/ 68 miles per gallon. With such superb mileage figures, Accord has not just left all other Honda cars behind in mileage, but the closest competitors including Toyota Camry (23.2kmpl) and Crown (23.2) Hybrids. However, the US version of the Honda Accord Hybrid which is due for launch in mid-2013, will get the combined mileage of around 20kmpl. But the difference between the mileage in Japan and the US is because of the different drive cycles and regulations used in the countries. Honda Accord hybrid will house a two-motor hybrid drive system, the similar will also power Accord Plug-In Hybrid. Honda that aims to produce about 10,000 units a year of the Accord Hybrid, will sell the vehicle a little higher than three million yen. 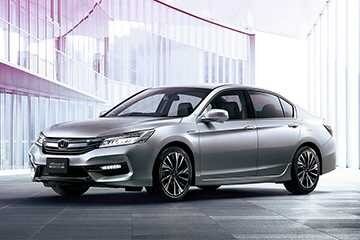 The Nikkei reports that, the Accord Hybrid will likely sell for slightly more than 3 million yen. Honda is looking to move around 10,000 units a year. A plug-in Accord Hybrid that can be recharged from ordinary power outlets will also be released in June. This vehicle will be available only for leasing by businesses and municipalities.